Silicon Valley research firm cites Decision Management Solutions as a visual and business-friendly extension to digital business platforms, June 22, 2017. Each year, Aragon Research selects Hot Vendors across multiple markets that are doing something truly new or different. They may have new technology that expands capabilities, a new strategy that opens up markets, or just a new way of doing business that makes them worth evaluating. James Taylor, CEO of Decision Management Solutions and Renee Trinidad of Kaiser Permanente will present Pioneering Decision Services with Decision Modeling at Kaiser Permanente at IBM InterConnect, March 20, 2017, Session Id: BBM-1740. James Taylor, CEO of Decision Management Solutions and Robert Lake, Senior Manager, Data Science of Cisco will present The Role of Decision Modeling in Creating Data Science Excellence at Predictive Analytics World in San Francisco on May 16, 2017. Two leading firms in decision management and decision modeling, Decision Management Solutions and Lux Magi, today announced the release of a definitive guide to decision modeling with the Object Management Group’s Decision Model and Notation (DMN) standard. 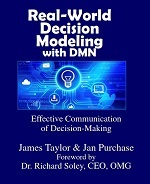 The book, “Real-World Decision Modeling with DMN”, has been published by Meghan-Kiffer Press and is now on general release, available for purchase from Amazon and Barnes and Noble. Decision Management Solutions is pleased to announce financial services and healthcare case study presentations at this Fall’s Building Business Capability Conference BBC 2016, Pioneering Decision Services with Decision Modeling at Kaiser Permanente with David Herring, Manager of BPM & ODM Delivery, Office of the CTO, Kaiser Permante and Beyond Textbooks: Building the Modern Business Architecture presented by Andrew Ray, VP Business Architecture & Change Management, Goldman Sachs & Co.
Decision Management Solutions today announced the availability of its new mobile-friendly interface for sharing decision models throughout an organization, DecisionsFirst Modeler Reader. With DecisionsFirst Modeler and the DecisionsFirst Modeler Reader, decision models based on the Decision Model and Notation (DMN) standard are easily shared and discussed with business owners and executives, improving technology alignment with the business, speed of delivery and business efficiency. Decision Management Solutions today announced the availability of the DecisionsFirst Modeler Enterprise Edition Integration with Red Hat JBoss BRMS. With DecisionsFirst Modeler Enterprise Edition and the integration for JBoss BRMS, decision models based on the Decision Model and Notation (DMN) standard can be more easily integrated with business rules being managed and deployed using JBoss BRMS, improving traceability and business ownership. Two leading firms in decision management and decision modeling, Decision Management Solutions and Lux Magi, today announced their collaboration on a definitive guide to decision modeling with the Object Management Group’s Decision Model and Notation (DMN) standard. The book, Real-World Decision Modeling with DMN, will be published by Meghan-Kiffer Press in mid-2016. Today we announced the successful deployment of the DecisionsFirst Modeler Integration with IBM Operational Decision Manager (ODM) at a large healthcare and insurance provider headquartered in California. The DecisionsFirst Modeler IBM ODM Integration is a key component of this leading organization’s process improvement and decision management initiative. We are pleased to announce that we have joined the OneDecision.io Consortium. OpenDecision.io was formed to promote the Decision Model & Notation (DMN) standard, published by the Object Management Group (OMG), by providing an open source reference implementation for automatic execution of DMN models. Leading Decision Management consulting and decision modeling software provider, Decision Management Solutions, has been cited as a “Sample Vendor” in the Gartner Hype Cycle for Business Process Management, 2015. Gartner is one of the leading independent information technology, research and advisory companies in the world. The yearly “Hype Cycle for BPM” report is developed by a group of Gartner Analysts based on their evaluation of current latest trends and technologies for Business Process Management. Decision Management delivers next generation claims systems that act immediately, increase agility, consistency and accuracy, improve customer satisfaction, speed response and reduce costs. Insurers can achieve significant speed-to-market gains, reduce fraud and create innovative new claims processes. The value proposition of analytics is almost always to improve decision-making. Being explicit about the decision-making to be improved is an effective tool for framing analytic requirements. Decision Management Solutions, a leading provider of decision management professional services, today announced a new Academic Licensing Program that will provide access to its decision modeling software, DecisionsFirst Modeler, as well as instructional and other materials for universities and colleges at a specially reduced subscription price. Decision Management Solutions, a leading provider of decision management professional services, today announced a free version of its decision modeling software, DecisionsFirst Modeler. The free Basic Version delivers the same user-friendly, DMN standards-based graphical decision models for up to three users to support collaboration on decision requirements for business process management, business rules, predictive analytics and dashboards design projects. Decision Management Solutions’ new research challenges the traditional analytics maturity curve, introducing an analytics capability landscape model to aid organizations in their BI and analytics purchase decisions. The new research report, The Analytics Capability Landscape, challenges the analytics maturity curve model and suggests an analytics capabilities landscape framework to better ensure that analytic capabilities used by an organization are aligned with business needs, are geared toward the intended user, and support decision-makers, both human and automated. In this third edition of the successful Microguide to BPMN, leading decision management expert James Taylor joins BPMN expert Tom Debevoise to create an integrated guide to process and decision modeling in BPMN/DMN. Starting with the basics and progressing to a comprehensive framework for modeling decision-responsive processes, the Microguide uses simple language aided with concrete use cases and scenarios to teach the reader how to properly use these powerful notations. Enterprise Edition extends DecisionsFirst Modeler’s collaborative decision modeling through integration with business rules and analytic development platforms. Decision Management Solutions, a leading provider of decision management professional services, today announced a new Enterprise Edition of its decision modeling software, DecisionsFirst Modeler. The new Enterprise Editions delivers user-friendly, standards-based graphical decision models integrated with implementation and application development platforms such as business rules management systems and predictive analytic platforms. By integrating decision modeling with implementation, DecisionsFirst Modeler Enterprise Edition delivers a platform for Decision Management that allows for managing and improving business decisions in complex, multi-vendor environments. We are pleased to announce today our partnership with Assure, a leading provider of analytics for Application Lifecycle Management. The new partnership will enable Assure’s customers to utilize decision modeling and decision management technology as a part of the Assure TotalView product. Assure will leverage this partnership to provide customers with a decision-centric, action-oriented dashboard. Additionally, it will offer a collaboration platform that extends Assure TotalView with insights from data mining and predictive analytics, as well as actionable recommendations based on configurable best practices. Decision Management Solutions, a leading provider of decision management professional services, announced today at the Building Business Capability Conference in Las Vegas, NV, their partnership with Pittsburgh, PA and Alexandria, VA based TechBlue, a consultative firm that delivers technology and strategic solutions that optimize operational performance. Decision Management Solutions and TechBlue are expanding on their existing collaboration so that TechBlue can now offer a full range of decision management consulting, training and software to its government clients. Decision Management Solutions’ newly published report, Predictive Analytics in the Cloud – Opportunities, Trends and the Impact of Big Data, found that cloud predictive analytics solutions are becoming mainstream, with broader and accelerating adoption. This adoption is increasingly driven by the value of predictive analytics to improve customer treatment and engagement. Decision Management Solutions, a leading provider of decision management professional services, today announced their partnership with Lux Magi, specialists in mentoring the application of Business Rules, Business Decision Modeling and Business Decision Management Systems to investment banks. Lux Magi is based in London, UK. Decision Management Solutions, a leading provider of decision management professional services, today announced their partnership with BCS – Dr. Juergen Pitschke, specialists in standards-based enterprise modeling based in Dresden, Germany. Decision Management Solutions and BCS are expanding on their existing collaboration to deliver decision-centric enterprise modeling in Northern Europe. DecisionsFirst Modeler delivers a new collaborative approach to decision modeling for enterprise architects, business owners, analytic professionals and business analysts. The Decision Management Manifesto is designed to help organizations adopt the Decision Management approach, apply it effectively in their own organizational context and increase the value of their technology investments. Opportunities, Trends, and the Impact of Big Data – The Predictive Analytics in the Cloud 2013 Research Report is now available. Decision Management Solutions launches survey to study the intersection of predictive analytics and cloud technologies in the era of Big Data. Decision Management Solutions releases Version 4 of its widely read Decision Management Systems Platform Technologies Report. Version 3 of our Decision Management Platforms Technologies Report is now available. This version significantly expands the Use Cases section. The use cases are divided up into a number of categories. Some of these are verticals, such as the section on government operations, while others are focused on categories relevant to multiple industries such as fraud detection or personalization. Within each section a number of real examples are explained. Content on Decision Management Systems and the platform capabilities necessary to build this new class of systems. Decision Management Solutions, the leading professional services firm specializing in decision management, today announced that Gagan Saxena has joined as Vice President of Consulting Services and Principal Consultant. “Decision Management is poised for rapid growth – as a natural link between business strategy and business operations. This is a powerful new way to consider business design that aligns business processes, enterprise data and numerous technologies in the most business-friendly fashion. I am excited to join James Taylor and team as we build out our consulting capabilities in this field,” said Gagan Saxena. Decision Management Solutions announces the release of the first version of their Decision Management Systems Platform Technologies Report 2012. Over 2/3 of survey respondents see real potential in cloud-based predictive analytics. Key drivers are customer acquisition, management and retention. Research results including white papers, webinars and podcasts are now available on our Predictive Analytics in the Cloud results page. PALO ALTO, CA (October 11, 2011) – James Taylor, a leading expert on Decision Management and CEO of Decision Management Solutions, today launched his new book, “Decision Management Systems: A Practical Guide to Using Business Rules and Predictive Analytics” (IBM Press). Taylor demonstrates how to combine technologies such as predictive analytics, optimization and business rules to transform largely passive information systems into Decision Management Systems that work actively to help maximize growth and profits, without massive IT investments. PALO ALTO, CA (August 23, 2011) – Decision Management Solutions announced today a multi-stage, multi-client study to assess the opportunity for businesses to take full advantage of the intersection of predictive analytics and cloud solutions, whether private, public or hybrid. The study will be directed by CEO James Taylor and hosted on Smart Data Collective, a leading online community for data professionals moderated by Social Media Today LLC.